WWW, January 2011 - Two vocals and seventeen massive Dubs: this is the second chapter of Radio Dubroom 2011. From cool and dreadly riddims by BR Stylers, DUB Terror and JAH Free to militant steppers by Disciples, the Powersteppers and online DUB Artist El Bib, here are seventy-eight minutes of pure heavyweight sounds in a non-stop selection by Messian Dread. 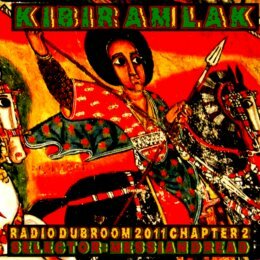 Kibir Amlak (Glory to JAH) says it all: this is a musical praise to the Father Son and Spirit. It starts of with three Dubs which can be downloaded for free (legally, of course) at http://mp3.dubroom.org. The massive BR Stylers vocal and Dub track can legally be downloaded for free as well. The Italian DUB and Roots Reggae band has truly delivered a classic with that one. Echo Ranks gives us some good meditation concerning the right use of technology , after which we dive into a long selection of stricktly, stricktly DUB.